Taft, CA — In a reaction to the Parkland, Fl shooting, California Gov. Jerry Brown just signed the strictest gun control laws in the county into action this month—again. Despite already having the strictest gun laws in the nation, California took it one step further, making it that much harder for citizens to defend themselves. Luckily, however, one mom in Taft, California was able to acquire a gun that she used to protect her four children from a home invader. Thanks to even more gun control measures, in California, residents will soon have to undergo background checks just to buy ammunition. Citizens’ AR-15 rifles must be modified to no longer fit the definition of what California calls assault rifles, or owners will become felons. And 18-20-year-olds will no longer be able to defend themselves with a gun. Despite having the strictest gun control laws in the nation, however, six million California citizens have been able to cut through all the red tape, jump through the legal hoops, and obtain at least one. Brittany Morse is thankful that she is one of those six million. Earlier this month, Morse’s 7-year-old daughter told her mom that she thought someone was in her home. Morse immediately went into fight or flight mode and decided to fight. “She opened the door, she sees him there, and slams it shut, screaming, running back to me,” Morse told KGET. Morse then corralled her children into a locked room where they would be safe and grabbed her gun and her phone. While on the phone with police, Morse unlocked her pistol and loaded the magazine of the gun she had just purchased only two weeks prior. She then confronted the robber, who she said had a knife on him, and held him at gunpoint. “I told the dispatch, ‘I believe he has a knife on him.’ And I told him, ‘You come near me, you take one step toward me, I will shoot you,'” she said. This man was clearly not concerned with the fact that there were people in the home as he had broken in at 6:30 in the morning. The man had taken her laptop, her paycheck, and some food according Morse. “He went through my purse. He didn’t take my credit cards; he didn’t take the money I had in my purse. He took bananas,”Morse said. Luckily for the man, Morse wished to preserve life, so she used only the amount of force necessary to protect her children and did not open fire on him, even though she would have been justified in it. The same cannot be said about officer Amber Guyger who allegedly thought she was confronted by a home invader and opened fire on an innocent Botham Jean, killing him. Morse held the man at gunpoint until police showed up and he was arrested and charged with burglary. Thanks to Morse and her support for the Second Amendment, the burglar, 25-year-old Aoreliorho Velasco will have another chance at getting his life on the right path and Morse’s children are safe. 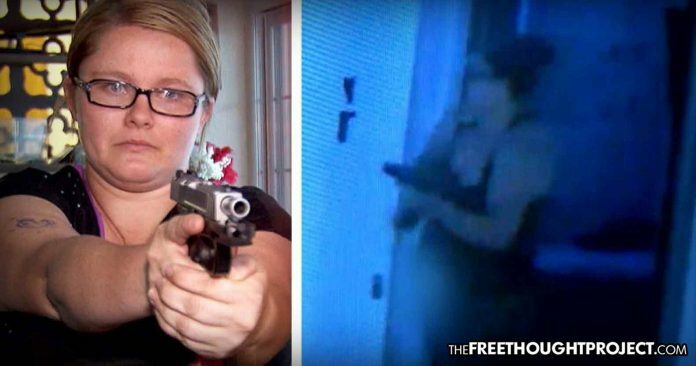 Below is the video showing the intense moments this mother of four proved that guns save far more lives than they take.